It’s no surprise that Amazon is a major player in the ecommerce space. With more than 310 million active customer accounts worldwide, Amazon is considered one of the largest and most valuable brands in the world. And for many, Amazon is the go-to place to shop for just about anything at any time. Our 2018 Omnichannel Buying Report revealed that 78% of global consumers made a purchase on Amazon in the last six months. The expanse doesn’t stop there. Websites with Amazon Pay added allow users to pay using their Amazon account, which provides a quick and streamlined buying experience by eliminating the need for inputting your credit card, mailing address, and other information. Having made its debut in 2007, Amazon Pay is no stranger to the game. In 2016, Amazon reported in an interview with PYMNTS that 33 million people in 170 countries had used Amazon Pay to make a purchase. Nearly a third of the transactions made by those customers were done via a mobile device, with an average transaction size of $80. Active merchants grew more than 120 percent year over year in 2016, while Amazon quickly expanded into France, Italy, Spain, and then India in 2018. Amazon Pay has no intentions of slowing down, either. Midway through 2017, Amazon announced Amazon Pay Places, adding the option to pay using Amazon into brick-and-mortar stores and restaurants. In 2016, more than 33 million customers in 170 countries used Amazon Pay to make a purchase. Payment volume nearly doubled in 2016, reaching peak volume on Nov. 28, when customers in the U.S. and the U.K. were offered Cyber Monday deals. Active merchants grew 120 percent between 2015 and 2016 as Amazon Payments expanded support for new areas, including government payments, travel, digital goods, insurance, entertainment, nonprofits and charities. The average Pay with Amazon purchase was $80 in 2016, and the largest single transaction that year was $40,000. A Forrester Research poll last year of retailers found that 58 percent were interested in Amazon Pay but had no plans to roll it out in the next 18 months. Another 38 percent said they were not interested in it at all. By contrast, 76 percent of retailers polled had either already added Apple Pay or were planning to do so. When it comes to online shopping, one of the of the greatest pain-points for shoppers is the complexity around detail input. Amazon Pay alleviates this friction by allowing customers to skip over their credit card details and shipping address, simply paying by inputting their Amazon login details. The tides of mobile shopping are turning as different demographic groups enter the age of shopping online. After surveying nearly 3,000 global consumers, we discovered that Gen Z shoppers are 2X more likely to complete an online purchase using a mobile wallet like Apple Pay, Amazon Pay or Google Pay than the average global consumer. As the world shifts to a more online environment, this trust and familiarity with mobile applications will only continue to grow. Amazon Pay installations and usage grew rapidly in mid-2016 across top 10,000, top 100,000, and top 1,000,000 websites on the internet. But for retailers, adding yet another payment option at checkout is a serious decision. Too much of a good thing: from a user experience standpoint, presenting too many options to the shopper may result in choice paralysis. The fees associated with alternative payment options may skim at your bottom line. Information security remains a constant worry of online shoppers. In their eyes, each payment option could open up a door to a breach or hack. So, why Amazon Pay? How does Amazon Pay work? and what are other retailers saying about it? That’s what we set out to uncover. Amazon Pay is a payments processing service that allows shoppers to use their Amazon account to purchase at other online stores. Instead of manually typing in their credit card number and shipping/billing addresses, the checkout process uses the details from the shopper’s Amazon account. This results in customers spending more time shopping and less time checking out. Amazon Pay fees are transaction-based and consist of two parts: a domestic processing fee and an authorization fee. Payments are also subject to applicable tax. Customers who use Amazon Pay are automatically protected under the Amazon A-to-Z Guarantee. There are additional fees and policies around refunds, pay places, and charitable transactions. Visit the Amazon website to learn more. Online stores using Amazon Pay and BigCommerce are seeing more and more customers choose Amazon Pay over other payment methods due to the flexibility on different devices and the preexisting trust with the Amazon platform. 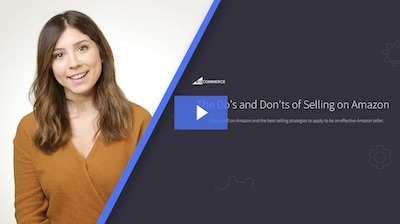 We sat down with several BigCommerce merchants and learned about how they use Amazon Pay to ramp up their sales. 1. For the team at PlayBetter, Amazon Pay was a no-brainer. PlayBetter is a one-stop-shop for outdoor adventure apparel and gear. We spoke with Chris Regan, their Director of Customer Happiness, to discover how the Amazon Pay button wins business. Why did you add the Amazon Pay button? Customers are looking for a streamlined checkout experience and with so many online shoppers already having their credit card information stored within their Amazon account, offering this simple and secure pay option was a no-brainer. How has the button been working? It’s great! Customers seem reassured when making large dollar purchases as we frequently see it used on our higher-end items. Many of our customer reviews state how easy the checkout process was and I think Amazon Pay has a lot to do with that. Since adding Amazon Pay in 2017, it’s been used on over 500 orders with an average order value of over $1000. 2. Mountain Crest Gardens sees more than 15% of 2018 orders use Amazon Pay. Experience Mountain Crest Garden’s site. Since 1995, family-owned Mountain Crest Gardens has expanded their succulent offerings to over 650 different varieties. Their VP, Matts Jopson, weighs in on how Amazon Pay has changed the way their customers shop. We added the Amazon Pay button primarily to make checkout as seamless and simple as possible for new customers. Especially for mobile users, anything that can reduce steps and friction reduces abandoned cart rates. Even on desktop (which still generates the most revenue for us) lots of customers are already logged in to Amazon on their browser, so checkout is literally a few clicks. We see lots of customers checkout with Amazon Pay, especially new customers. There’s plenty of positive feedback in our Shopper Approved reviews about how convenient it was to use Amazon to check out. Over 15% of our 2018 orders used Amazon Pay. 3. Serious Shops benefits from a streamlined checkout process… and more. Serious Shops is a collection of distinctive and unique products like puzzles, plush toys, and specialty beverages. To keep up with the ecommerce shuffle, Co-President Adam Moore is always looking for ways to streamline and secure the checkout experience. How was the Amazon Pay button implementation process? Implementation was painless – really, not much more than the flip of a switch. We inserted the button at all entry points to the checkout process and we added our bank details via our Amazon Pay merchant account. Each day, Amazon Pay automatically funds our account. Would your recommend Amazon Pay to other stores? We would absolutely, and without hesitation, recommend adding Amazon Pay to any store. The benefits are numerous (improved conversion, better customer experience, streamlined checkout, daily funding, increased customer confidence, brand recognition, …) and the added costs are nil. If store owners are looking for ways to optimize store metrics and improve customer experience, adding Amazon Pay is pretty low hanging fruit. 4. For Crossrope, more payment options = more revenue. Switch up your exercise routine with a high-intensity jump rope workout. CMO Srdjan Popovic chatted with us about what added value the Amazon Pay button brought to their ecommerce site. We wanted to provide our customers with multiple payment options and we felt Amazon Pay was a great option for today’s consumers. It’s been working well and we’ve noticed through our screen recordings that the purchasing process is very fast and smooth. It has processed more than $70k in revenue for us. 5. BeautifiedYou sees a decrease in cart abandonment. Los Angeles-based BeautifiedYou has provided luxury, high-end, and physician-dispensed skin care products since their beginning in 2010. Co-Founder Jimmy Nguyen tells us about how easy it was to add Amazon Pay into their BigCommerce store. How has the Amazon Pay button been working? The button has been working great. We have seen an increase in overall conversions, especially conversions directly attributed to Amazon Pay. Very easy. It took one minute after we received our credentials. 6. Added brand credibility aids Perfectly Priscilla Boutique’s growth. A fashion retailer with a positive mission and trendy pieces, Perfectly Priscilla is experiencing monumental growth with support from their customers. According to Co-Founder Tommy, adding the Amazon Pay button was an easy and quick way to gain even more business. We added the button because it makes the checkout process much faster and easier and also lends credibility to our brand. Would you recommend Amazon Pay to other stores, and why or why not? We would recommend Amazon Pay to other stores because it’s a seamless checkout process for most of your customers. How Can I Integrate Amazon Pay on My Website? Adding an Amazon Pay button into your website is a fast process that can quickly help improve your conversion rate and grow your business by creating a seamless shopping cart experience. Below are the steps to take to add Amazon Pay to your website. 1. Setup your Amazon Pay account. Register your Amazon Pay account. Once you’re registered, you’ll need to login to Seller Central on the Amazon website to complete your account setup. 2. Enable Amazon Pay on your website. Enable Amazon Pay in your site control panel. For BigCommerce websites, this takes just a few quick steps. After testing the button in sandbox or preview mode, you will be ready to go live and officially add the button to your site’s shopping cart experience. For retailers that are looking to quickly diversify payment options and optimize the shopping cart experience for users, Amazon Pay is a super-quick way to get great results. In an age of high mobile engagements and increased efforts to improve website UX/UI, add-ons that bridge the gap between your site’s native commerce experience and the trusted power of Amazon are important to staying relevant, building your brand, and delighting your customers. Legacy retailers who are struggling with shopping cart abandonment and low conversion rates must look to innovative solutions to help maintain and build business. For businesses considering adding an Amazon Pay button to their BigCommerce website, our integration makes it seamless to add and takes minutes to be up and running. It’s a surefire way to gain more sales. What types of results has your store seen by using Amazon Pay? Leave a comment below and let’s chat.